The brown sugar glaze on this delicious baked ham gets extra flavor from maple syrup and apple juice, or substitute honey or agave nectar for the maple syrup. Use dark or light brown sugar in the delicious glaze. 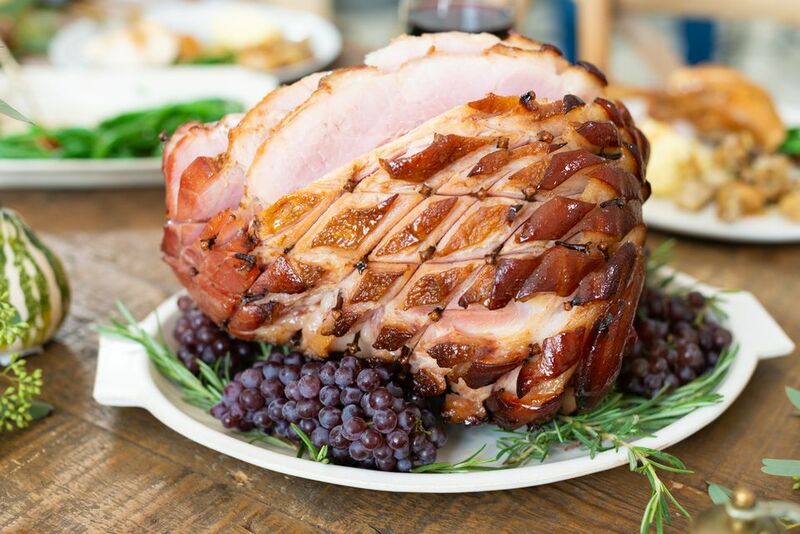 Ham is an excellent choice for Thanksgiving, Christmas, or Easter, and it makes a delicious Sunday dinner. Or cook the ham for any weeknight meal and use the leftovers for casseroles, breakfast dishes, soups, and pasta dishes throughout the week. Use the ham bone for bean soups or pea soup. Line a roasting pan with foil and place a rack on it. Heat the oven to 325 F.
Place the ham, fat side up, on a rack in the prepared roasting pan. Score the fat all over in a diamond pattern, cutting to a depth of about 3/4 of an inch. If desired, stud with cloves. Insert a clove into each intersection, or "X" of the diamond pattern. Bake the ham in the preheated oven for about 18 to 20 minutes per pound, or until a meat thermometer or instant-read thermometer registers at least 140 F, the optimal temperature for a fully cooked ham. In a medium saucepan combine the maple syrup, brown sugar, apple juice, mustard, and ground spice (if using). Place the saucepan over medium-high heat and bring the mixture to a boil. Boil the mixture for about 2 minutes (be careful not to let it boil over). About 20 minutes before the ham is done, spoon about half of the glaze over top of ham; return it to the oven. About 10 minutes before the ham is ready, brush the remaining glaze mixture over it. Cover the ham loosely with foil and let it stand for 10 to 15 minutes. A fully cooked ham which has not been USDA inspected—most are, but check the label—must be cooked to a safe minimum temperature of 165 F. If the ham is labeled "cook-before-eating," cook it to a minimum temperature of 145 F.
Substitute honey, agave nectar, or golden cane syrup for the maple syrup in the brown sugar glaze. A 6-pound half ham—bone-in—will serve approximately 12 people or about 2 people per pound. A boneless 4-pound ham will serve approximately 12 people. Ensure you have a large enough ham for leftovers, and you might want to send guests or family members home with some ham. A half ham weighs approximately 5 to 7 pounds. For a whole ham—10 to 15 pounds—allow about 18 to 20 minutes per pound and double the glaze ingredients. Use the glaze on a pork loin roast, roasted pork chops, or ribs. Brush glaze onto the meat about 10 minutes before it's ready.